From the makers of Candy Crush Jelly Saga comes a new match-3 puzzle game. But this time, there are flowers – lots of them. Sounds boring? Not at all! Linking buds together to make flowers and triggering a chain reaction of blooming buds can give you instant nirvana. It is one feel-good game that you must play, even if you loathe match-3 games. 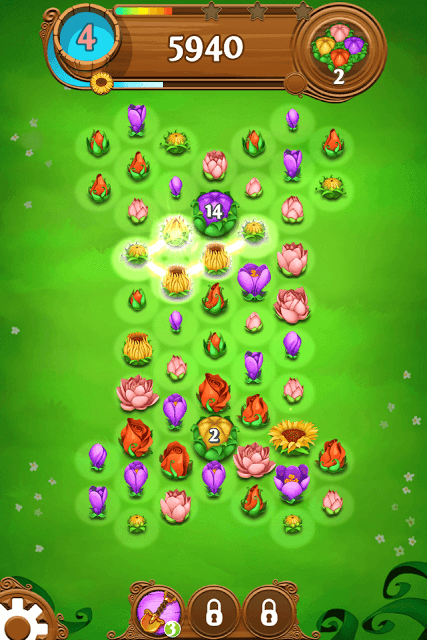 Blossom Blast Saga has stunning visuals and sound effects. The sound of breaking glass slabs and pots, buds blooming into colorful flowers shows how serious developers at king are to give players a splendid gameplay experience. You won’t be bored playing levels as each level has a completely different layout and objectives. The Bloom meter located in the top of the screen, just below the water bucket, indicates when a bud will bloom when you link buds together. Chain together buds of the same color and keep an eye on the bloom meter. If the water goes through the first flower, then the last bud of a chain will bloom into one. The meter will help you choose the best matches, which will ultimately lead to more flower blooms. The flower located in the end of the bloom meter triggers a super bloom. You will need to make a longer chain of buds or a chain that includes bigger buds to make the water reach the last flower. When the buds start shaking, release to get a super bloom. A super bloom will trigger a flower blast, making other slightly bigger buds bloom into flowers. When you link buds together, the last bud of the chain will grow bigger or bloom into a flower. Keep this in mind while playing levels that task you to break obstacles or reduce the big bud count to zero. In “Big Bud” levels, your aim is to reduce the number on a big bud to zero. To do this, you should link together buds of the same color into the bid bud or bloom any bud next to it. When blooming a bud next to the big bud, make sure that the last bud is located close to it. Remember the last bud of a chain blooms (if the water goes through the first flower in the Bloom Meter) so the last bud should be near a big bud that has a number on it. In pot levels, bloom buds next to them to clear the path. Here also, you will have to make sure that the last bud is close to a group of pots so that you can break multiple pots with a single bloom. For levels that have buds under glass tiles, try to make sure that the last bud of a chain should be under a glass slab to make it bloom. Yes, buds under the glass can be linked with same-colored buds so make sure the last bud of a chain should be under glass. When chaining buds together, make sure the last bud is close to bigger buds. This way, when the last bud of a chain blooms, it will trigger more blooms. 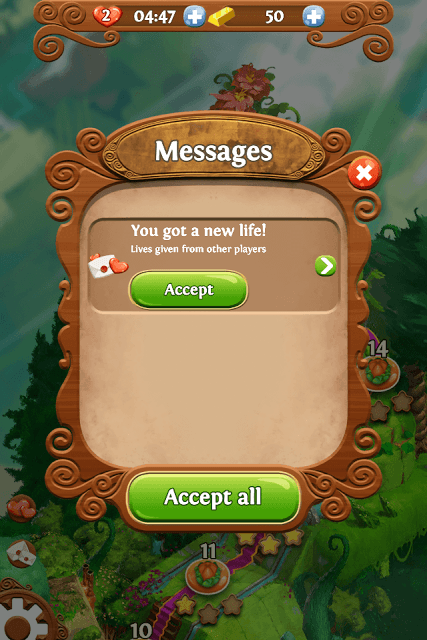 Blossom Blast Saga’s lives system not only lets you send heart requests to Facebook friends, but also to players around the world. To get lives from random players, tap on the plus sign button beside hearts on the top of the game screen. Next, tap on the green “Ask Friends” button. You will see a list of online players. You can choose the “select all” check box to request lives from all online players or uncheck it to send lives request to selected players from the list. Next, press the “Ask” button to request lives. Best strategy is to select all players; someone from the list will send lives to you. You will be notified once you receive lives. Make sure you have turned on notifications for this game. Once you receive them, go to your mail box to get them. You will have to get a King account to receive lives. Sign up via Facebook or email and only then you can receive them from a random player or a Facebook friend. Don’t hesitate to send lives to other players, they may return the favor. On the map, tap on a level. You will notice a horizontal online leaderboard showing a list of top 10 players who scored points by completing that level. Tap on the heart icon beside an online player’s profile pic to send lives. When linking buds, don’t be in a hurry. Scan the game board and hunt for long chains of same-colored buds. A big bud match will fill the first bloom meter, and the last bud of the chain will bloom into a beautiful flower. A flower can make adjacent buds bloom if they are big enough. This kind of triggers a chain reaction, creating a splendid scene of blooming flowers. The more the buds bloom; the closer you will be in reaching your objectives. 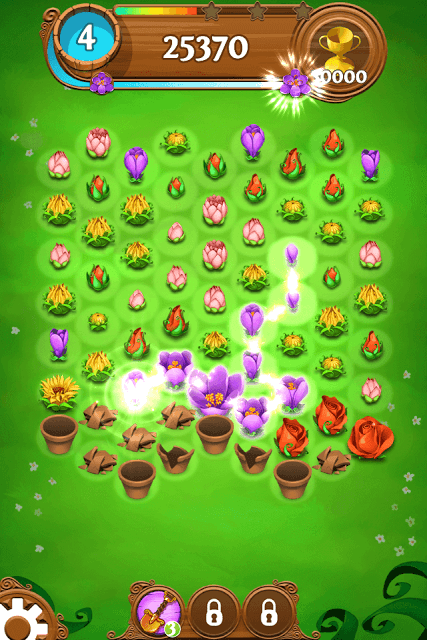 Chain blooms will also increase your total score and you may receive more than one star. So have patience, look for longer chains or big same-colored buds that you link and create a chain bloom. If you link small buds together, you will need to create a long link to create a bloom. If there are a few bigger buds, then a smaller chain will create a bloom. Look for such same-colored chains that contain bigger buds to make blooms faster. 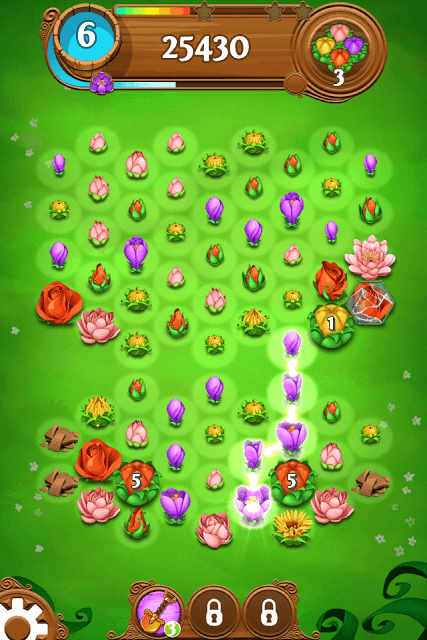 Remember: More blooms will help you complete objectives and score more points. The horizontal online leaderboard shows the top 10 players who have scored highest points for a particular level. You can find this leaderboard just after you tap on a level. It appears below the green “Play” button. The leaderboard shows the highest scorer in real-time, so if you score more points than the current ranked 1 player, your profile will be shown on the leaderboard. Replay levels where you couldn’t score higher and beat a rival player’s score. You may follow the tips above to score more points.